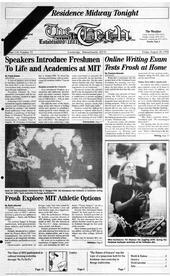 President Vest's announcement to house all freshmen in dormitories starting in the fall of 2001 infuriates me. I hope MIT's students understand how gravely they've been insulted. Requiring freshmen to live in dorms is tantamount to saying, "These people are not mature enough to be trusted to make a decision about their housing." You didn't come to MIT in order to be treated like children or to have decisions made for you. I hope this year's freshmen make the most of the opportunity they've been given, and make a choice taking into account all of their options. Soon, many of those options will not be available.